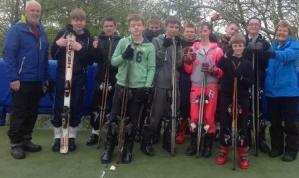 THREE members of the same family helped Haslingden High School win a skiing competition. Tom, Alice and James Chapman are all seasoned skiers. Tom, 17, and Alice, 16, teach at Ski Rossendale while James, 13, has been skiing since he was three and is a regular at the Rawtenstall slope. They all go on annual skiing holidays. They joined three other students who were also representing Haslingden High School as a sixth form team entry in the North West Schools’ Competition at Pendle dry ski slope at Sabden. As well as winning the sixth form team category, Tom was also placed third out of all the sixth formers who entered.